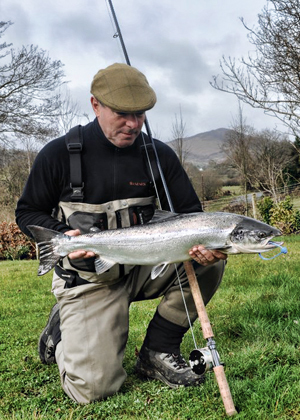 Few Irish sporting estates can rightly assert to be World-class but for one it is a fully justified claim, County Donegal’s Glenmore Rivers Estate. Unique in the quality of the game angling, deer stalking and rough shooting it offers, Glenmore goes a step further and into a league of its own. In excess of sixty kilometres of pristine estate-run rivers teem with salmon and trout while the 24,000 acres (10,000 hectares) of shooting ground is home to herds of Red deer. Throughout the winter the hillsides and bogs provide unrivalled woodcock and snipe shooting; the numerous lakes give opportunities for outstanding duck shooting and trout fishing. Centred around a luxurious lodge which offers the best of Irish hospitality, Glenmore comprises a huge swathe of the Glenfinn Valley, in the shadow of the imposing Blue Stack Mountains. In this desolate landscape, close to Europe’s most westerly Atlantic coastline, amongst the peat-bogs and mountain loughs of this pristine land, streams tumble through a myriad of waterfalls and rocky pools, joining to become one of Europe’s finest salmon fisheries, the River Finn; and it is to these nursery streams that up to ten thousand salmon return annually to spawn.